For those that don't know, the phrase “SD” means Super Deformed. Super Deformed figures are often relatively small and cheap, but some can be harder to find than others. This particular release from 2003, titled the "Kaiju Club", could be bought in a set with SD Kiryu 2, SD Mothra '03, SD Godzilla '03, and SD Godzilla '54. This release, featuring the Meltdown Godzilla being swarmed by two Aggregate Destoroyahs, was one of many that fell into a unique set that included those listed above, Godzilla facing Biollante, Godzilla facing Battra, and many others. Standing at an inch and a half, this SD figure is made of soft vinyl and is small enough to fit on ones pinky. It's a hollow figure meaning it can be pushed in, but then reshape. This also means some pets will try and use them as chew toys, so keep them out of your furry buddy's reach. The figure, while small, does sport some good detail. While its not much to write home about, it features some decent texturing and a good paint job, at least for Godzilla himself. 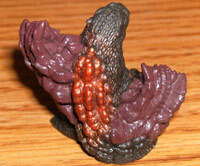 He features the proper burning marks and his teeth and claws have all been painted a good color. The same can't be said for the Destoroyah. They barely look like the miniature Aggregates that swarmed Godzilla in his final battle. There's no texturing or detailing on the Destoroyahs and they weren't even properly painted. 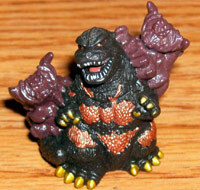 They're no longer red, but a sort of purple which just looks like Godzilla is covered in tiny blobs. Truth be told, I only got the five figure set at G-Fest because I had some cash left over and needed change. It's not anything great, but I guess if it is getting hard to find, one should pick it up.